I first saw him in dragon zakura..
and then,I started to searchd and found about him even more.Without realising,I've already become his fans..LOL..
demo i still need to hear him sing, talk, dance and act xD.. hehe ..
ehhh..weird..Hmm..daijoubu I'll just post it here..in the pics and scans thread..
kYAA~that's my te-chan..he want to do wat he likes. but honestly speaking i wasnt paying much attention to him at that time. my habit is to google every dorama that i watched and know more about the actors. 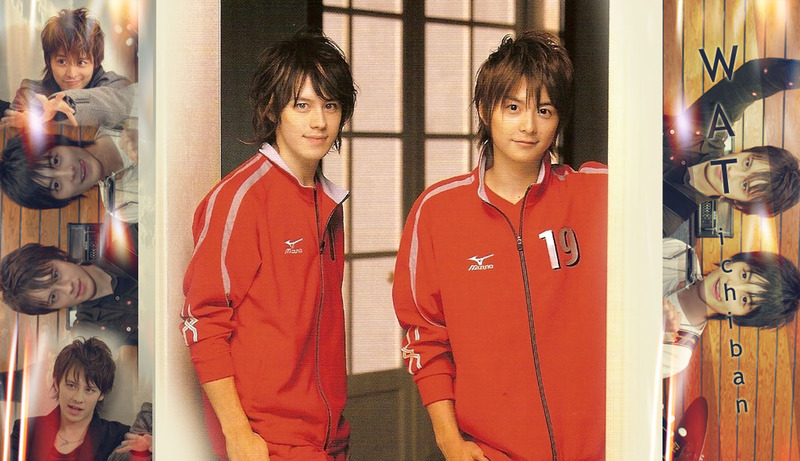 so i found teppei and found out that he was part of a duo called WaT. i didnt pay much attention to them, until i saw this video of them singing Boku no Kimochi. my love for them will never fade, i guess. it's been more than a year already. so,it was water boys snow-chan?haven't watch yet..
as for me,it's dragon zakura!the pink highlight of te-chan's hair is sooo kakoi!! i first saw him in gokusen 2..
hahaha..honestly i didnt notice him.. moco-kun first got my attention but in the latter part of the series i find him so cute.. then everything goes.. hehehe.. i fallin love to him more and more.. every time i wake up.. hehhe..
but te-chan for sure will be my ichiban! you guys should watch water boys, because it teaches us about friendship and unity..
hoo..Gokusen!hai2.very short indeed.haha.But the most kawai! But I really dun thnk I can watch water boys. haa! why cant you watch water boys? is it because u will get a nose bleed everytime you see half naked guys? I cant bear to see te-chan in 'that' suit.wahaha..
ORANGE TRUNKS here i come!!! Haha..And i'm not going to watch it~haha..
and te-chan said he's hving prob during filiming since he cant swim..
yes yes! and i read that he's really noisy in his sleep. and he likes to kick people in his sleep. he worked really hard when he was filming water boys and he will use the only spare days he have to practice swimming! Regardless his kawainess..that's our te-chan. uwah!..anO,,i first saw te-chan in GOKUSEN 2 that was aired here in the philippines..
but i nver notice him before..
cUz,,im nOt that kind' of die hard fan before..
..i then saw him again in a picture with toma ikuta..
nweiz..i then ask my friends of the name of that cute guy behind toma-kun. uwah!..i search all night long..
and sy to my seLf..it was him! it was him!.. the cute guy in gOkusen 2..
and after that..i then watch all his movie..
the WATERBOYS 2,KIDS,LOVELY COMPLEX,DRAGON ZAKURA,SHIBATORA..
..im still looking for some doramas..
and that MY FAVORITE GIRL is the one i want to watch..
but i cant find the vid w./ sub..huhuhuh T_T ..
Ohhkay! lemme intro you guys one dorama! cuz teppei is an intern doctor. teppei looks like an asian version of harry potter there. ohh evbon-san, can you understand chinese? if you can, you may wanna try tudou.com. cuz i got the video from there, and its with chinese subs. Ahh..I almost frgotten.tnx snow-chan.hai2..iryu team med dragon..sugoi medical dorama!!!!! But it seems he played ijuiin role very well ne~Must be lot of thng need to be memorised..huu. aHeM!..tHe cLips are cUte tO looK at hehehe..
te-chan is Like a cute teenage guy.. Oh..iryu?..i just finish the first epi..
oOh..i've gOne through tudou..i cant understand chinese..
that's why im looking for the eng sub..
and till now i havent find one..
to be honest i was kinda irritated by his character. and the fact that i was irritated by Ijyuin means that teppei is a great actor cuz he portrayed his character well! but it gets better near the end when the team was formed. ijyuuin's a great man through and through! oOH..i guess i sHouLd fiNish the doraMa..
Demo2,I like him the most in dragon zakura! E-chan..U should finish iryu!and please move to season 2 after that..
ooh..yeah..i hope i couLd find the cLear online stream site..